Luncheon for the Non-Rocket Scientist. Since having children I am rarely on time to anything that involves the four of us. Herding cats must be easier than getting two toddlers dressed, fed, out the door and strapped into the numerous safety devices in the car. On our recent trip we were either too early or too late. Our hostess was still at her rocket scientist job and we realized that we had failed to take into account our luncheon options. The kids were fine with the yoghurt we’d packed along, but Mrs. E. and I were out of luck. By the time our hostess came home, we were famished. 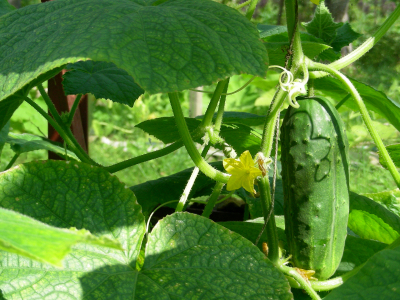 So it was with grateful abandon that we tucked into the simplest of summer meals: a sandwich made from just picked cucumbers. Perfectly delicious, summery, very easy to make and if you trimmed the crusts, even a little bit elegant. I would have never thought to make these this way. Then again, I’m no rocket scientist. 4 slices of homemade country white bread. That’s it. Can also be used as a dip. It’s summertime, the recipes should be easy! This entry was posted in Entertaining and tagged luncheon, recipes, summer. Bookmark the permalink.